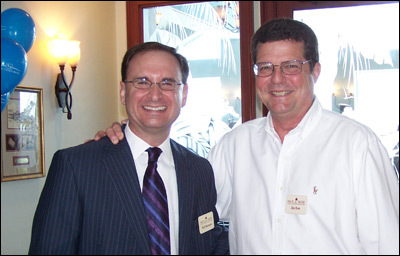 Attorney Philip Bonamo, partner at Rice & Rose and current president of the Volusia County Bar Association (VCBA), was the host and moderator of the VCBA's Annual Luncheon held this year at the Halifax Yacht Club in Daytona Beach on April 13, 2010. Approximately 90 members were in attendance, including several Volusia County Court Judges and 7th Circuit Court Judges, as well the Public Defender for the 7th Circuit, James Purdy, and the State Attorney for the 7th Circuit, R.J. Larizza. The VCBA was very honored to have as its guest speakers for the luncheon the current Florida Bar President, Jesse Diner, and his wife, Adele Stone, who is the current President of the Florida Bar Foundation. 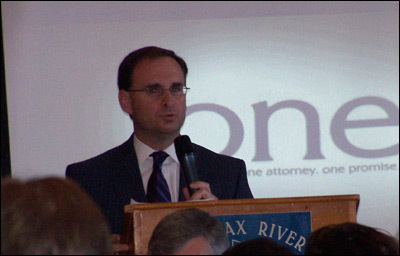 The luncheon was also the platform for Volusia County's kickoff of the 'ONE CAMPAIGN', which began in the Fall of 2009, and has been established by the Florida Supreme Court and the Florida Bar Foundation to encourage and facilitate attorneys throughout the state to become more involved in pro bono or free representation for the legally indigent.